Mobile phone is a revolutionary invention of the century. It was primarily designed for making and receiving calls & text messages, but it has become the whole world after the Smart phone comes into the picture. In this project we are building a home automation system, where one can control the home appliances, using the simple GSM based phone, just by sending SMS through his phone. In this project, no Smart phone is needed, just the old GSM phone will work to switch ON and OFF any home electronic appliances, from anywhere. You can also check some more Wireless Home Automation projects here: IR Remote Controlled Home Automation using Arduino, Bluetooth Controlled Home Automation along with DTMF Based Home Automation, PC Controlled Home Automation using Arduino. 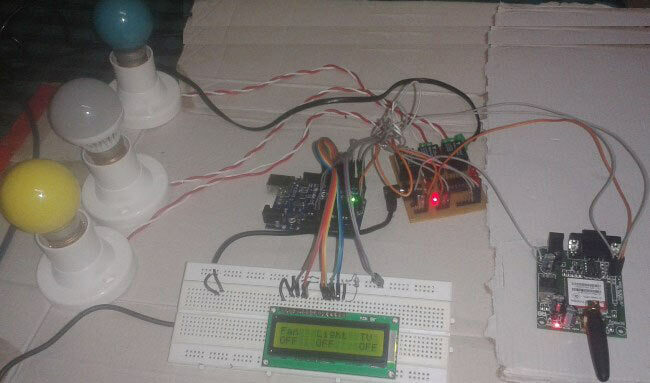 In this project, Arduino is used for controlling whole the process. Here we have used GSM wireless communication for controlling home appliances. We send some commands like “#A.light on*”, “#A.light off*” and so on for controlling AC home appliances. After receiving given commands by Arduino through GSM, Arduino send signal to relays, to switch ON or OFF the home appliances using a relay driver. Here we have used a prefix in command string that is “#A.”. This prefix is used to identify that the main command is coming next to it and * at the end of string indicates that message has been ended. When we send SMS to GSM module by Mobile, then GSM receives that SMS and sends it to Arduino. Now Arduino reads this SMS and extract main command from the received string and stores in a variable. After this, Arduino compare this string with predefined string. If match occurred then Arduino sends signal to relay via relay driver for turning ON and OFF the home appliances. And relative result also prints on 16x2 LCD by using appropriate commands. Here in this project we have used 3 zero watt bulb for demonstration which indicates Fan, Light and TV. Connections of this GSM based home automation circuit are quite simple, here a liquid crystal display is used for displaying status of home appliances which is directly connected to arduino in 4-bit mode. Data pins of LCD namely RS, EN, D4, D5, D6, D7 are connected to arduino digital pin number 6, 7, 8, 9, 10, 11. And Rx and Tx pin of GSM module is directly connected at Tx and Rx pin of Arduino respectively. And GSM module is powered by using a 12 volt adaptor. 5 volt SPDT 3 relays are used for controlling LIGHT, FAN and TV. And relays are connected to arduino pin number 3, 4 and 5 through relay driver ULN2003 for controlling LIGHT, FAN and TV respectively. In programming part of this project, first of all in programming we includes library for liquid crystal display and then we defines data and control pins for LCD and home appliances. After this serial communication is initialized at 9600 bps and gives direction to used pin. For receiving data serially we have used two functions one is Serial.available which checks whether any serial data is coming and other one is Serial.read which reads the data that comes serially. After receiving data serially we have stored it in a string and then waiting for Enter. When Enter comes program start to compare received string with already defined string and if string matched then a relative operation is performed by using appropriate command that are given in code. Is this Code really working sir? I would like to ask for the complete code this sir, i'm interested in making this project sir! Please Send me the the Code sir! yes, this code will work fine. uploaded code on the website is complete. copy it and go ahead. Is it okay sir to use 5v-4 channels relay instead of 5v SPDT relay and a ULN2003 driver? Cause i've been trying it using your code and a relay module but it doesn't work(still without an Output connected to it). I can't see where mobile number was used in code. I think you should remove Semicolon from the "if statement"'. Thanks to your code sir! It's working but the initial state of the relay module i used is ON, and all of the commands are inverted. How can i correct this sir? Glad that your project is finally worked. You must have connected NC terminal of Relay to the AC appliances, instead of NO, just swap them. Check this article for Relay working. I make this project.but the relay not work properly. please give the information of relay connection. hiii dennis sir .you did this project?.can you please send me the complete code as fast as possible . @ashind The given code is complete. @Rajendra What do you mean by "relay not working properly", give us more detail. Circuit diagram clearly explains the connections, connect NO and NC terminals of relay properly. which allows the user to unlock the door remotely by sending an sms to the gsm module. Check this project: Automatic Door Opener using Arduino and taking use of both of these projects, you can build one and please share with us. Gsm module how can I interface with gsm module? Ofter set at commends do we need to delete them? Can I use 3phase motor starter contorl? which program do you use to draw the schematic for the circuit diagram ? does this code is same for 8051 or diffrent if so plz provide me the 8051 code. sir, i did as prescribed and it is working fine with the serial monitor. but when it comes to gsm module it does not respond to the second message. ie, if i send #A.tv on* for the first time , it works fine... but then the system does not respond to whatever message i send to the gsm module.... have been with this problem for a lot of time... please help me sir..
Gsm Module is SIM900A, its already given in the description. @Maddy can i use SIM900D over SIM900A? The code is not being uploaded.dnt knw y it is happening.does d code need any modification? no need of any modification in code. remove rx and tx pin from arduino before uploading code. sir, can i use sim 900A inplace of sim900. if yes, then is there any change in programme. ULN2003 can drive upto 7 Relays, use ULN2803 for 8 Relays. Change the code and connections accordingly. Please send the GSM module to my email id. Your site is good and I am beginner. I wanted to learn. sir im using 12v/2A GSM module. can u please explain the current and voltage supply rating for the whole circuit. can i use 12v 2A adaptor for whole circuite..? can one use sim800 in place of sim900? will any gsm module work with the same code? Yes, any GSM module should work, just check its Tx and Rx connections. I am doing project "WIRELESS WEATHER MONITORING SYSTEM"using arduino uno, GSM sim900a, LCD 16x2, temperature and humidity sensor dht11…now I request yourgood self to please provide me a program that will display current temperature and humidity on LCD. also if we send SMS from any mobile number to a mobile number of simcard that is in GSM to send current temperature or humidity it must send back SMS to the mobile number from which it received SMS with current temperature or humidity.. Check this one :Humidity and Temperature Measurement using Arduino, and try to integrate the GSM Module. i like to share my home automation project. and will also shunt down the power. Please provide your project details like circuits diagram & project code. you may try with long wire antenna or also you may change your operator. Sir, I want to do the same project by using micro-controller 8051. As i am new comer i want detail information about it. plz send me on my email. Thanks, looking forward for your kind reply. Very nicely explained project ever I came across. It has created a lot of interest in my son including me. I thank for your sincere and fare sharing of knowledge. sir if we are using microprocessor there are two circuit diagrams one is for transmitter and another is for receiver but here is only one so is it like combined or what?? Transmitter is our cell phone itself. Hi im thinking to make this project does this works properly? Project is working properly, please share the Error you are getting. can someone help me pls. I connected the circuit as shown above. the LCD is ok but it is not responding to the on/off messages. I'm using sim800l. is there any modification in the program? if yes, how do I go about it? Check the data sheet of your Module, you just need to find out serial communication pins Tx, Rx and power supply pins (Vcc and GND) in your GSM module. Hi i am working on project, appliances control & switching using gsm & bluetooth , can you help? hye sir , do you create ur own relay circuit ? can i have the schematic . i just kind of confuse whether the relay circuit have connection that related to Arduino Uno. Yes, its custom created Relay Module on Dot board which has ULN2003 on it. It may available in the Market too. can the same program run on arduino mega? ... I can't find uno board in my area but I've a mega board. how can I modify the circuit or /and program to suite mega board? Same code shall work in Arduino Mega. What should be the current rating of the 12 v adapter? GSM module is powered by using a 12v 1A adaptor.